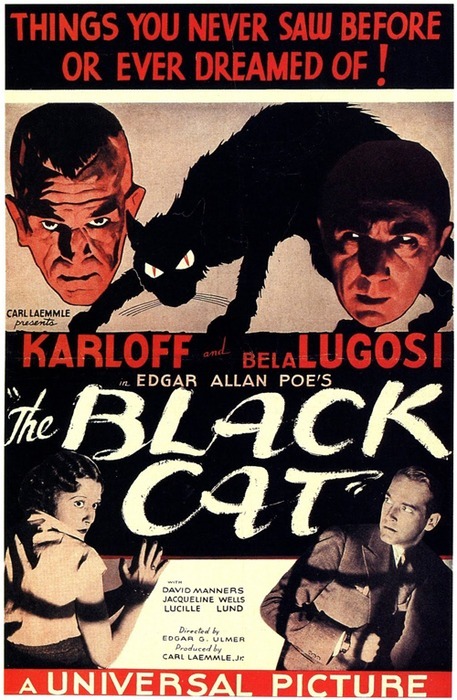 The Black Cat (1934) saw the first team up of Bela Lugosi and Boris Karloff onscreen. Unfortunately it is a pretty tired affair, for me never managing to scale the heights of some of the two’s more iconic efforts. For much of its running time, the film seems pretty content to coast by, hoping the audience will be wowed by the fact that the world’s two greatest horror stars of the time were finally onscreen together. 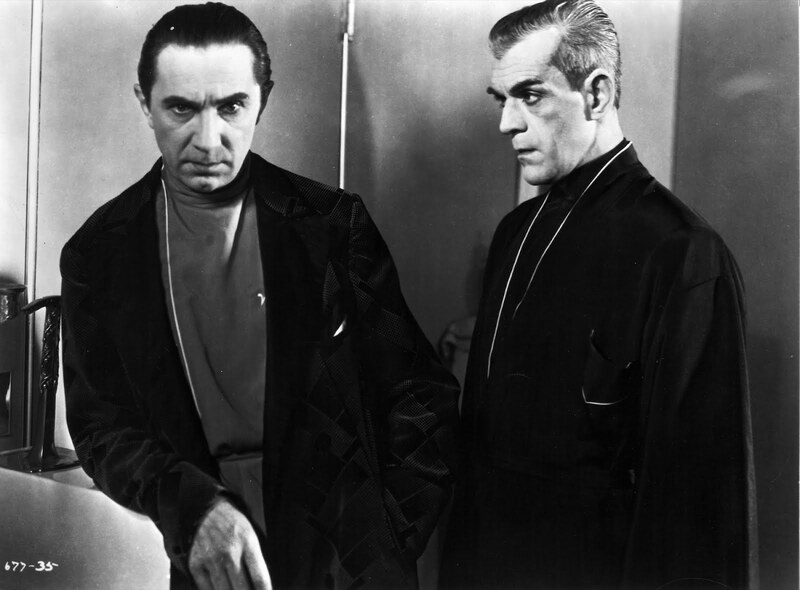 Lugosi stars as the creepy, suspicious engineer Dr Vitus Werdegast, whilst Karloff is a Satanist or something. There are plenty of references to the war littered through what is a pretty poor script, however if it was aiming to be some sort of comment on post-war life or the effects that such a transformative historical event could have on two people, it did not work for me. Into the sphere of these two comes newlyweds Peter and Joan Alison. Before too long Karloff has his sights set on incorporating Joan into one of his freaky Satanist ceremonies. This naturally leads to a chess game to see who has rights to the couple… That is the kind of plot that is at play here. Unfortunately there is no real strong narrative core to the film whatsoever or even proper attempts at character creation. The placing of iconic stars into the roles is what passes for character development here. Aspects of the film are decidedly unnerving, though not as in the way a horror film can successfully unnerve the audience. Necrophilia overtones are just plain unsettling in any context. The quality of the film does swing up in the last half hour. However because what has preceded it is so dire, the audience is totally uninvested in caring about what happens to the characters onscreen. It is a shame then that the atmospheric satanic ritual scene toward the end, nicely shot with a bunch of close-ups, is essentially wasted because you won’t care what happens. Ditto an extremely dark scene involving a character being skinned. As for the all star cast (if two people can constitute ‘all star’), Karloff fares a fair bit better than Lugosi. The former is introduced in a clever but perhaps too self-referential manner. He awakens from sleep and the audience sees his very Frankenstein’s Monster esque profile sit up in a very Frankenstein’s Monster esque way. The makeup that Karloff is forced to wear is totally distracting too, which is saying a lot given this is a man whose makeup in The Mummy (1932) and Frankenstein (1931) did not detract from his performance (if anything it boosted his work in both films). Despite the material and his performance, Karloff does show his acting talent in this film. Lugosi it must be said, does not fair so well. In comparison to his rightfully iconic performance in Dracula (1931), he is pretty weak here. Coming from the Universal stable, The Black Cat unsurprisingly showcases some pretty incredible set design. The mansion at the centre of a majority of the plot must be one of the studio’s greatest achievements in that regard. Massive, labyrinthine and simultaneously gothic and ultra modern, the house manages to bring an atmosphere to proceedings that is decidedly lacking elsewhere in the film. Unfortunately The Black Cat lacks the snap and panache that make the best Universal horror films classics that remain essential viewing today. It just totally failed to hold my interest whatsoever. Outside of a pretty incredible set and a decent last half hour, the first superstar team up from Lugosi and Karloff is a pretty inconspicuous one. Heard of this but never seen. Think I’ll pass. I think that is probably a good call. There are so many other Universal (and other) horror films from this vintage that are so great, this one is not really worth the time.